Telfer Joinery provide a 3D Design and Kitchen Supply only service. Our 3D Design and Kitchen Supply service allows you to get a fantastic cutting edge kitchen supplied direct to your door. In order to make the 3D kitchen design and supply process as simple as possible for you, please contact us at design@telferjoinery.co.uk or call us on 01383 660289 to discuss what we need from you, so that we can design your kitchen. Choose from our extensive kitchen range from here. If your door choice needs handles, chose from here. 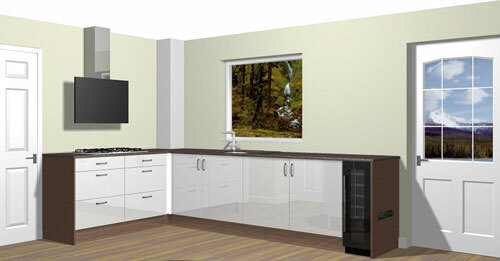 Once we have all your room information, our designer will then produce your 3D kitchen design. Once you are happy with the design, we will then give you a price for your kitchen. When your order is confirmed, all your drawings will be emailed to you including the technical drawing, which is necessary to allow the correct installation of your kitchen. All orders take approximately 4-5 weeks due to the bespoke manufacturing process. Your kitchen units will be delivered fully assembled including the doors all hinged and attached and protectively wrapped. Supplied pre drilled to provide 5 adjustable shelf positions. Come with 150mm adjustable legs with + / – 10mm adjustment. Soft close hinges as standard except on fridge freezer housings and “L” shaped units. Glazed doors have 4mm clear toughened glass. Glass shelves are 6mm clear toughened. All glass has the BS6206 Kite mark. Soft close drawer boxes are grey and fitted as standard. Standard depth of drawer is 450mm. All cabinets are made from 18mm Melamine Faced Chipboard. These are available colour coordinated but not matching the doors. All cabinets are glued and dowelled. All units are assembled with 18mm back boards for rigidity. All wall units have 3 way, adjustable and concealed hanging brackets fitted. Each pair of brackets conform to DIN68840. Our wall units come in three standard heights. A Low wall height of 575mm. A Medium wall height of 720mm. A High wall height of 900mm. The Zurfiz range of doors come with the individual option of either, a matching, a glass effect or a brushed steel effect edging. Wood grain colours come with a grained effect. With a vertical direction on the doors and panels and horizontal direction on drawer fronts. Most doors are available made to measure to suit your room. All doors and cabinets are manufactured in the UK. You will not find all these features as standard on any high street outlet. Obviously, Telfer Joinery would prefer to install your kitchen for you but we do realize that people like the flexibility to choose. Therefore, a 3D Kitchen design and supply service is the right choice for you. Have you considered a garage conversion ? If so then just give Telfer Joinery a call or contact us here.